The performance of the tool has a significant impact on the finish of work and works. In particular, performance of the Baren will affect the finish of the work. The chisel has basically 4types. knife,veiner,flat,gouge. these vary in size from large to small. These are used depending on the application. Image is a front of the blade,The chisels has front blade and back blade. The core of the Baren is spiral plying bamboo fiber. Plying bamboo fiber is various types and used depending on the application. The baren is very important tool when pressing the wasi-paper against the block to obtain the woodblock picture. These days, plastic baren also became popular. It does not need to replace the sheath of bamboo, and strong against water. 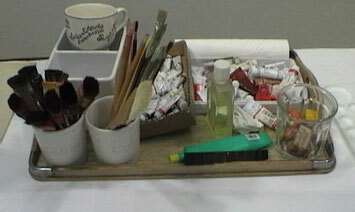 Brush mix a pigment and a starch paste and is used to broaden evenly on the block surface. These vary in size from large to small. They will be selected depending on the size of the block surface. Their hair has been trimmed by the skin of the shark. The orthodox round brush "Maruhake" is in three brushes lined on top of the image. they are made of horsehair. The three brushes in the lower right corner of the image, are rubbing-brush "Surikomihake". They are brush that is used originally to stencil dyeing. They are made of the summer hair or winter hair of deer. The two brushes in the lower left corner of the image, are carry-brush "Hakobifude". It is used to carry the pigment to the block surface. It is made of bamboo fiber. Water-brush used in order to wet the washi-paper and the woodblock. The wshi-paper has basically 3types, hosho type, torinoko type, ganpi type. The thickness of wasi-paper is expressed in units of "Monme". These vary in thickness from 3 monme to 25 monme. Effect of the Baren is affected by the thickness of the paper. Effect of Baren is lowered according to the wasi-paper thickness becomes thicker. Various wood is used for blocks. Cherry-wood(ukiyo-e prints), box-wood(for end-grain), japanese Katsura(judes tree), Ply-wood etc. Cherry-wood is high-grade and delicate carving can be and is used for ukiyo-e prints. Plywood(shina) is also suitable to a big work making. In preparation for woodblocks, I recommend that sand block surface with abrasive paper, as the wood grain. Then, printing will be easier. Water-base pigments and oil-base pigments. Water-base pigments is india-ink,poster-colores,water-colores,gouache etc. Oil-base pigments is mimeograph-ink,oil-paint colors. I do not recommend too much. Because they are danger that the oil contained in them will saturate the paper during printing and a possibility of damage to the block. Tracing film and Carbon paper for tracing picture, Starch paste for mix to the pigment, Paperboard for wet the wasi-paper.